ROOIBOS – South Africa’s unique health beverage enjoyed by the whole family for generations. Perfect anytime, hot or iced, with or without milk & honey. FESTIVE MEDLEY – Savor the warmth & cheer of the holiday season with 4 exceptional blends of spices, fruits & flavors that capture the tastes and aromas of traditional home baked favorites: Eggnog, Gingerbread, Pumpkin Pie, Apple Pie. I am not really a big fan of eggnog. I don’t dislike it, it’s just not something that I like well enough to ever really buy when I’m in the supermarket, much less attempt to make from scratch. 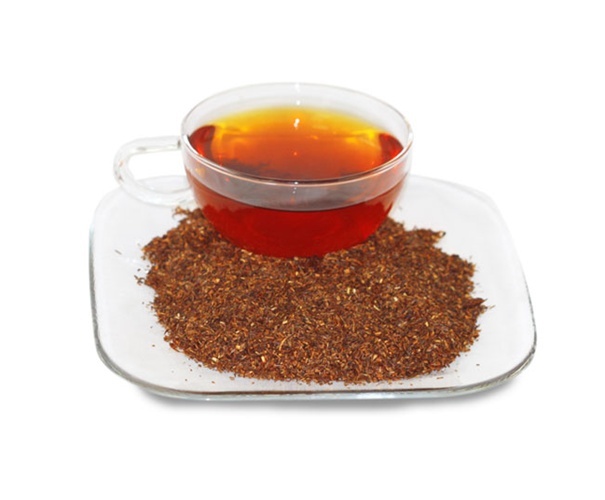 But I am really liking this cup of eggnog rooibos tisane from Suffuse! The flavor is similar to eggnog – and it is sweet, creamy… almost custard-like. The red rooibos is a perfect base for this blend, because the natural nutty flavor of the rooibos tastes very good with the eggnog flavor. I am also tasting nutmeg. Overall, this is a very enjoyable cup. It’s naturally caffeine free, so it would be a good one to serve around the hearth when your family and friends are celebrating the holidays with you. I found it to be tasty as a hot beverage – I imagine it would be even better with a splash of rum in there! 2 days ago, I found out that Suffuse is going out of business.